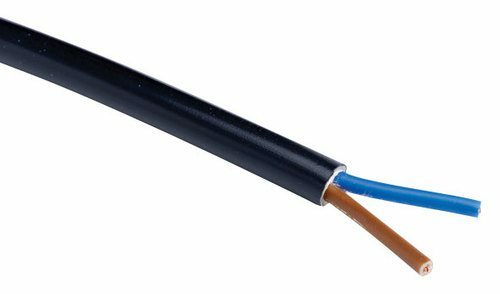 10 Amp Brown & Blue H05VV-F Flexible Circular Wire for Light Duty Indoor & Outdoor uses up to 500V such as Lighting, Washing Machines, Hoovers, Spin Dryers, Refrigerators and other small appliances. General purpose flexible PVC cable suitable for use in dry domestic, commercial, indoor and outdoor conditions. It can be used for general electrical and security applications such as lawnmowers, Power Tools, Extension lead & Trailing Sockets, Table & Floor Lamps, Radios, office equipment, lighting pendants, CCTV, Intruder Alarm and Access Control. Needed this to lengthen wire for lights and was unable to buy in any of the DIY stores. So pleased to find it on this site. Came within a couple of days too. Thank you so much. The service I received and prompt delivery were excellent. The product was exactly as described and just what I needed. Thanks for your assistance, I will not hesitate to use you again for other products. A good cable perfect for my needs.